A typical windmill can be converted to generate enough electricity to power a modest sized home. Using the windmill to recharge a battery bank suited to the needs of the home is the simplest and most effective method of wind power storage. The average backyard engineer can convert a windmill to generate electricity in about four hours. Convert the drive shaft of the windmill to turn a generator. 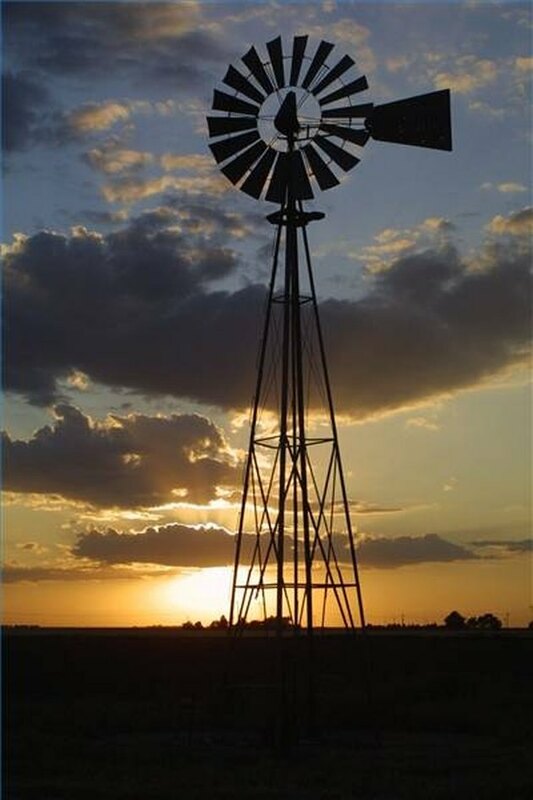 Most old windmills were constructed to pump water from the ground, either for livestock or people. As utility companies began to supply water to any homestead inexpensively, such windmills fell out of use. Their main drive shaft turns a pump at the base, which is connected to the water supply in the ground. As the wind turns the vanes, the water is pumped into a reservoir. This shaft must be disconnected where it meets the pump, and windmills can vary in this respect. Some will have the force put to the pump at a 90-degree angle, and some will drive the pump directly without power differential. When the shaft is disconnected, it will be at an angle or straight. The main conversion of this shaft is to weld a large sprocket close to the end of the shaft so that it can turn a bike chain. The shaft measures about 2 inches wide, and can be fitted with the sprocket by sliding it over the end once it is disconnected from the pump. Weld the sprocket so that it can handle the amount of force required to turn the generator. Mount the generator with the main pulley fitted with a smaller sprocket than the windmill's drive shaft. Typically, alternators and generators will have a pulley at the end, to be driven by a belt. Weld the bicycle sprocket to the end of the pulley to allow the unit to be driven by the chain. Place the generator/alternator at the base of the windmill, and align it so that the pulley sprocket can be linked to the chain attached to the windmill shaft. Usually the frame of the windmill will work for this mount, but in some cases it is necessary to raise the generator up on cement blocks or another heavy-duty structure. Install the inverter and wire it to the home. Wire the inverter to the leads on the battery bank. The bank--which will have one negative and one positive terminal--will run through the inverter, which "steps" the power up to 110 volt, suitable for use in the home. Inverters come in different wattages and different levels of quality; the wattage should match the power requirements of the house. Run the standard 110-volt power lines from the inverter to the home's fuse panel with the outdoor cable. Test all connections with a voltmeter to ensure a circuit path, then release the brake mechanism on the windmill to activate the power generation.